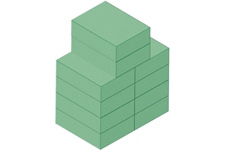 Stealth-Core Positioning Sponges have unique angles incorporated into every sponge that offers artifact-free imaging and increased stability. Soft open cell, polyurethane foam provides excellent support and comfort. Non-allergenic. Meets the new California 2015 Technical Bulletin #117-2013 standards. Fresh light mint-green color. 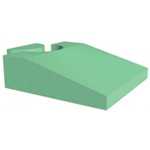 Stealth-Cote Positioning Sponges is the COATED version of the Stealth-Core polyurethane foam. This new proprietary mixed medical grade coating creates a unique skin membrane that is durable and easy to clean. The surface is resistant to blood, Betadine, barium, alcohol, oils, and other fluids. The unique angles incorporated into every sponge offers artifact-free imaging and increased stability.Anti-microbial: antibacterial and antifungal. Self deodorizing. Meets the new California 2015 Technical Bulletin #117-2013 standards. Fresh mint green coating.